I don't think I'm alone when I say that one of the highlights for me on the run up to Christmas is the special hot drinks that get released. I know people go cuckoo over the Pumpkin Spiced Lattes from Starbucks, but for me, I get stupid excited about the Costa Christmas drinks. It's my go to coffee shop and I'm never let down by them (apart from that time I ordered a caramel latte and no caramel syrup was added, but we'll let that slide). When the menu gets released, not only do I know exactly what I want to order next time I'm in the shop, but I also get a ton of baking inspiration. There's just something about seeing what the team have created for this season that makes me want to bake! Last year, I made a batch of peppermint hot chocolate cupcakes inspired by the Costa Christmas drinks menu, which were super duper tasty, but this year, I've taken it up a level. The release was all over Twitter and as soon as I saw it, I instantly knew that I wanted to do something that was related to Billionaire's Shortbread. Now, just making some slices of shortbread would be too simple. Don't get me wrong, I love making it and the way it tastes, but I wanted to play around with all the different elements of Billionaire's Shortbread and so, these cupcakes were born. The first element that I took into consideration was the chocolate. As you'll know, there's a layer of chocolate on top of the caramel on a slice of Billionaire's Shortbread, but that's just not enough chocolate in my opinion. And because this bake is inspired by hot chocolate, it needs to be a key character, so with that in mind, I decided to go for a chocolate cupcake base using my go to cupcake recipe. Next was the caramel, and I don't know about you, but that's my favourite part of Billionaire's Shortbread. 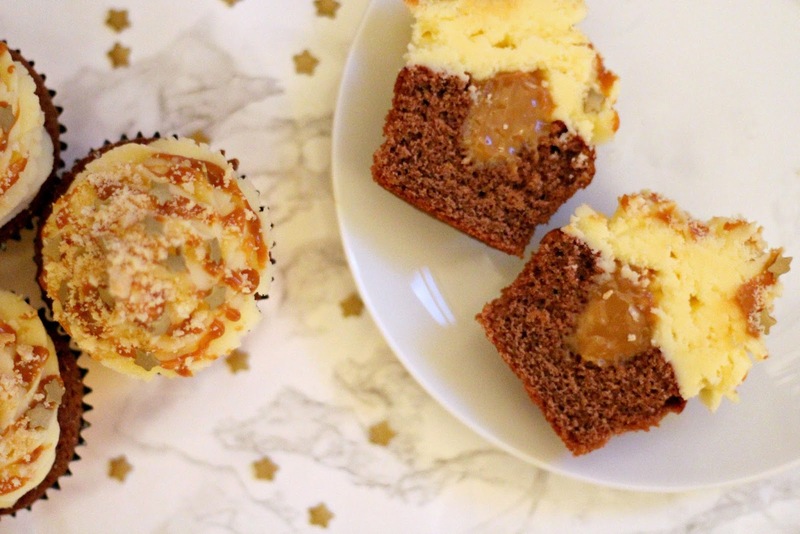 It's sandwiched between the biscuit and chocolate, and in the drink, it's drizzled in the glass, so to get this sense of it being 'in the middle', I scooped out the centre of the cakes and poured some caramel inside. 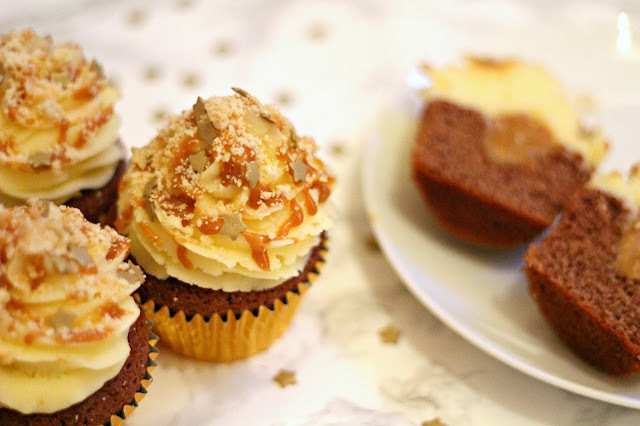 You get a gorgeous hit of gooey caramel in every bite! For the icing, I wanted to give the impression of whipped cream as Costa top their hot chocolate off with a good serving of the stuff. So instead of using regular buttercream, I added double cream into the mixture, making it super smooth and melt-in-the-mouth-esque. It makes it very naughty, but of course, you don't have to add the cream in if you'd rather not! J is absolutely head over heels for it, so I have no doubt that we'll be seeing this super creamy buttercream again this season. The icing has been topped off with even more caramel (because why the heck not) and crumbled shortbread. I toyed with the idea of sticking a piece of shortbread into the icing, but it would look a little odd, so crumbled shortbread it was. I also threw on a bunch of gold stars because why not add a little extra Christmassy flair? In a large bowl, beat the butter reserved for the buttercream to soften it further, then add in your icing sugar 100g at a time, beating after each addition. When you have reached your desired buttercream consistency, add in your double cream and vanilla extract and beat til combined. You may have to add in a little more icing sugar if your buttercream becomes too loose. Once your cakes have fulled cooled, use a cake corer or a knife to make a well in the centre of each. Fill the well up with Carnation caramel (beat the caramel in the tin with a spoon and it should loosen) then pipe your buttercream on top. Drizzle more caramel over and crumble your shortbread on. Then finish with any decorations! Even just writing this post out has made my mouth water. 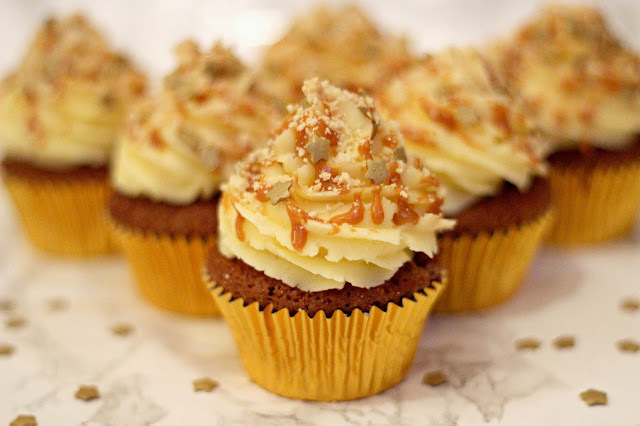 The caramel works so well with the chocolate, and that buttercream? Insane. These would go down so well with a cup of tea or a hot chocolate on these chilly nights, or as a festive treat for a Christmas party. Or you could just scoff them all yourself, which I think would be my preferred way of serving them. YES! I feel you, I much prefer Costa to Starbucks when it comes to drinks! These cupcakes look and sound INCREDIBLE! 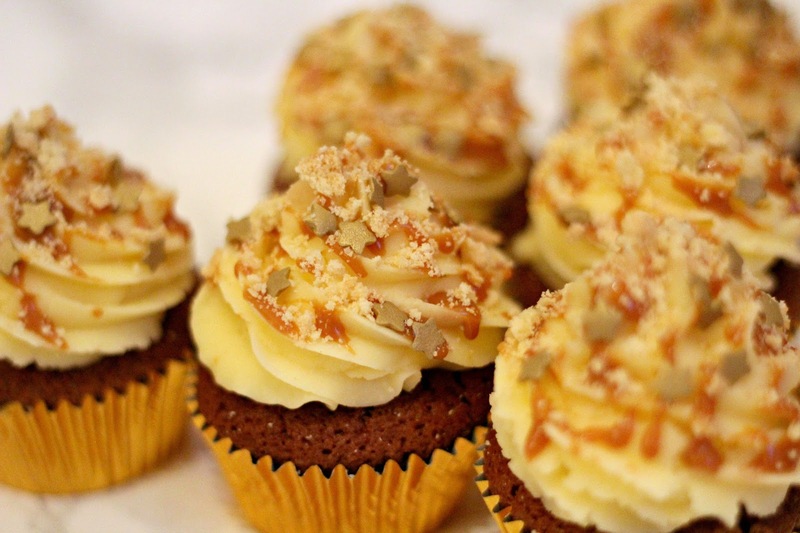 I absolutely love a good Billionaire's Shortbread and these cupcakes have all the deliciousness of it and look amazing! Great idea!